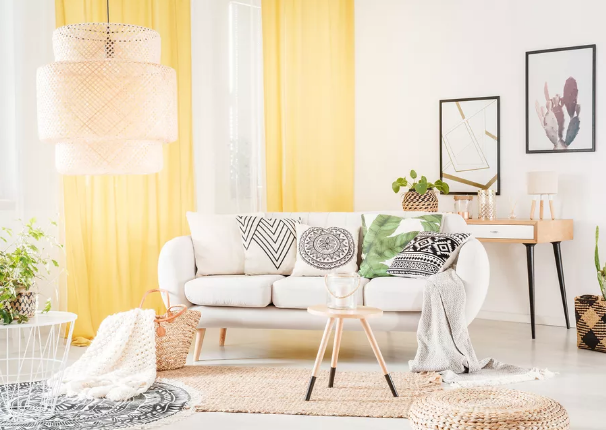 Decor Ideas That Will Give You the Warm Fuzzies : A house doesn’t become more of a home until it’s been decorated. Read on to discover nine decorative ideas that are meant to personalize your home. You’ll grow to love your home even more than you already do. Show an Unloved Wall Some Love : Not sure what to do with that weird in-between wall in your long hallway? A smartly placed silhouette like this bird decal will add a dose of delightful whimsy in a surprising place. First, give it a leg up. The old legs on the IKEA Karlstad sofa shared on the left were replaced with a new set by Pretty Pegs called the Estelle 170. For your information, IKEA also sells stylish gams. Next, spring for a colorful upgrade. You can go from drab gray to dusty pink with a slipcover by Cover Couch. Cross Stitch an Old Dresser : We heart cross stitching because it’s fun and easy to do. The gang at Molly Makes shares how you can dress up an old dresser using a needle and yarn. Awkward No More : Got an awkward piece of storage furniture? You can turn that eyesore into beautiful decor with peel and stick wallpaper. Dress up Your Door Knobs : Dressing up your interior door knobs is a cute way to personalize your space. You can use jewelry, tassels, baby shoes —​ you name it! Treat Your Home to Clean Air : Indoor air pollution is no joke. The air quality in some homes can be five times higher than outdoors according to the EPA. A couple of spider plants will reduce the number of harmful airborne chemicals in your home. Show a Simple Wood Chair Some Love : Woven wall hangings are on trend. This idea shows how to dress up a boring chair with yarn and fabric. Here’s how to get weaving. Get Motivated : A non-cheesy and funny motivational poster is a decor accent that can provide much-needed inspiration for turning around a bad day. Show Your Coffee Table Some Love : Piles of mail. Dirty dishes. Stacks of old magazines: All classic signs that a coffee table needs a little decor love. An attractive tablescape will spruce it up.